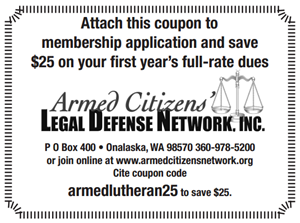 This week on Armed Lutheran Radio we're talking about gun safety and taking new shooters to the range. We'll meet Yehuda Remer, the author of the new kids book “Safety On: An introduction to the world of firearms for children.” Lloyd's 7-year-old daughter shares her impressions of the book, plus thoughts on the latest Dana Loesch NRA video, and tips from Aaron, Mia, and Sgt. Bill. Lloyd shares his reaction to the reaction to Dana Loesch's April video for the NRA. Today's special guest is Yehuda Remer, Orthodox Jew, Texas transplant from the People's Republic of California, and proud gun guy. He's also the father of three and he's written a children's book to teach kids about guns and gun safety called Safety On. Sgt. Bill shares his thoughts on kids and guns from the perspective of a police officer in today's Ballistic Minute. Aaron Israel talk about the recent incident where a woman ran over a purse snatcher with her car and why we shouldn't be celebrating or applauding her actions. Mia Anstine encourages you to take new shooters to the range this summer in today's Motivation. O God, the Protector of all that trust in You, without whom nothing is strong, nothing is holy, increase and multiply upon us Your mercy that, You being our Ruler and Guide, we may so pass through things temporal that we finally lose not the things eternal; through Jesus Christ, Your Son, our Lord. Amen.